I recently followed an online course called “Inspiring Leadership Through Emotional Intelligence” given by Professor Richard Boyatzis of Case Western Reserve University. He explains how to inspire people who come to see us for a coaching session and talks about the importance of making the person imagine her “ideal self”. 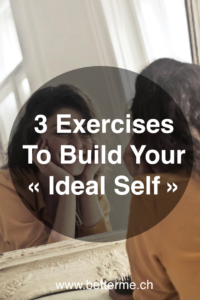 Given that it is a crucial component of the Solution-Focused Approach that I use with my clients, I wanted to give you 3 exercises that will help you define your “ideal self”. This exercise will help you set goals in your life and thus help you to guide your future actions. For every point of your bucket list, ask yourself if you can do it right away. If you do, do not hesitate and enjoy the pleasure of crossing off the first objective on your list! For this second exercise, you will have to use your imagination. You will have to imagine what your ideal life would look like in 10 years and describe it on a sheet of paper. Before starting to write, remember Bill Gates saying: “most people overestimate what they can do in a year but underestimate what they can do in ten years”. Imagine your ideal life and be ambitious in your description. Again, take care to describe in details what each area of your life will look like. The more your description will be specific and detailed, the more it will help you to have a clear vision of your values and things that really matter in your daily life. For these last exercise, you’ll have to use your imagination again. Imagine what would change in your life if you won the lottery today and became a billionaire. Imagine what your life would look like if you no longer needed to support your financial needs. This exercise will allow you to identify the activities that are truly important to you and may help you to ask yourself the right questions about your job or the activities you practice during your free time. This will also bring out unmet needs in your current life and can help you find ways to fulfill them. If you wish to live a happy and inspiring life, it is important to know the direction you want to go. These 3 exercises will allow you to accurately describe your needs, objectives and values and build a clear picture of what your ideal life might look like.